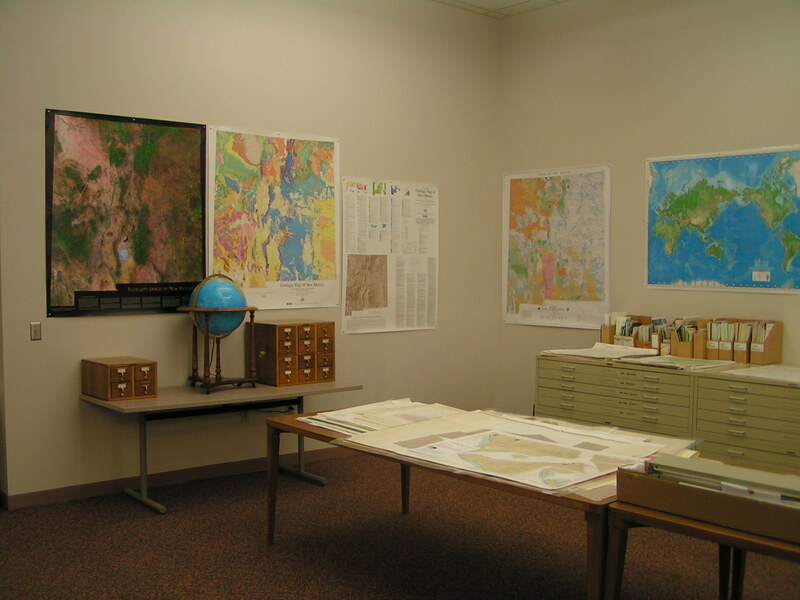 Yet another of our undiscovered, underutilized treasures at the State Library is our growing collection of USGS Topographic Maps. Covering all 50 States and some overseas territories, the collection numbers in the thousands and dates from the 1880’s to the present. Topographic maps show not only towns, roads and streams, but also elevation and terrain. They are extremely useful in assessing changes to the earth over time. The bulk of the collection was acquired due to the State Library’s designation as a Federal Documents Depository Library beginning in 1960. 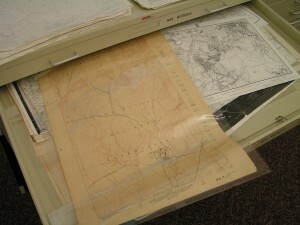 This designation also enabled the Library to acquire other useful maps such as those produced by the Bureau of Land Management and the Forest Service. Our “Regional” designation also provided us with some not-so-useful for a land-locked State: Nautical Charts that span the globe. It is apparent from searching through the collection of “Topos” that the State Library has been collecting by other means, as in the case of the more vintage maps. Many are stamped with the names of individuals or private firms and the Office of the State Engineer has been most generous in passing on their duplicates. It’s unfortunate that the earlier maps are “large scale” showing large areas with little detail, but one must remember that they were produced in the day when all surveys were ground surveys with teams on horseback or wagon carrying heavy transits and measuring chains. Looking around the State, it’s easy to see what a difficult task that can be. Aerial surveys with stereoscopic photography didn’t get started until the 1930’s. The 7.5 Minute Series (1:24,000 scale) of maps are what we most commonly refer to as “topos” these days. These maps represent roughly 45 square miles at our latitude. It’s interesting that even with enhanced surveying techniques, it took over 40 years for the USGS to complete all 2034 maps for New Mexico alone. The State Library continues to add to the map collections, striving to have a paper copy of each edition published for the 7.5 Minute Series covering the State. This has become problematic in the past few years as the USGS is not printing paper copies for distribution to Federal Depository Libraries. They do provide them digitally through their USGS Website: http://www.usgs.gov/pubprod/ for anyone to view and download. We’re currently working on ways to reproduce full-size copies from these digital records for our collection and perhaps to provide them for patrons, on demand, for a modest fee. Also, if you’ve searched our catalog for these maps, you may have noted that it doesn’t appear that we have that many. In this case, don’t believe the catalog. For many years, due to staff shortages and differing philosophies of collection accounting, we failed to indicate items that we held in our collection. We are working to remedy this as fast as we can. In the mean-time, please contact us. If we really don’t have it, we’ll help you find it.